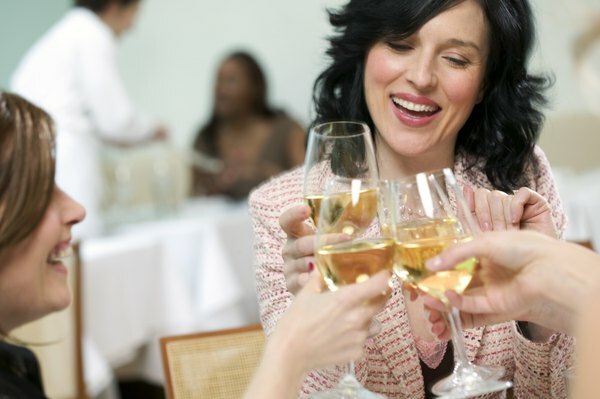 Having drinks after work instead of during lunch could save your job. Just because you're off the clock and not being paid for time you spend at lunch doesn't mean your employer can't hold you to certain standards and workplace policies concerning your behavior. If you come back to the office after you've obviously enjoyed a couple of beers with your lunch or a martini or two, it's likely that you'll be fired, especially if your performance takes a nosedive because you're a little tipsy. Finding an organization that doesn't have a drug and alcohol workplace policy probably doesn't have an employee handbook or any other policies. Workplace policies prohibiting drinking at work are pretty much the norm rather than the exception. Those TV shows where the executive keeps a crystal decanter of whiskey with matching glasses in his office is just that -- TV. Regardless of the industry, even if it's the food-and-beverage industry, employees aren't supposed to be drinking on the job or during the business day if they're working any part of it. You could justify having a beer with lunch or even a couple of martinis by saying your lunch break is your own time and you're not on the company premises, so you can do whatever you want. But, as they say, "It's complicated." Granted, you're not being paid to have lunch, but you could be fired for drinking during lunch, especially if it impairs your judgment, decision-making or motor skills to the point where you cannot do your job. In addition, depending on your position in the company, you could be fired for straying too far from the organizational philosophy of the type of behavior it wants supervisory and management personnel to exhibit. The transportation industry has strict guidelines on drinking during work hours and, for workplace safety purposes, lunch is still part of the workday, even if you aren't getting paid for it. Many employers follow the same rules on alcohol use that the U.S. Department of Transportation issues because they're endorsed by government standards and, therefore, easy to apply to any work environment. The DOT says that public sector employees, people who work for charitable foundations and companies that own and operate commercial fleets are prohibited from engaging in safety-sensitive duties while drinking alcohol, within four hours of drinking alcohol or when the employee has a 0.04 percent or higher breath alcohol concentration. Under the Occupational Safety and Health Act, employers are required to provide workers with a safe working environment, and this is easily extended to cover protecting employees from other employees who pose a danger to themselves and to others. Alcohol can do that. An exception that could save you from being fired for drinking during lunch is if you're an alcoholic. Under certain conditions, alcoholism is an impairment covered under the Americans with Disabilities Act, or the ADA. Your employer can't get rid of you because you're alcoholic, but if you are, the company will probably weigh the circumstances before immediate termination. Employers that fire employees who belong to protected classes, such as employees with qualifying disabilities, may be exposing the company to liability for wrongful termination. The fact that you may have had a drink at lunch isn't the real issue here. It's the performance issue that employers are concerned about when it justifies terminating you for drinking at lunch. Even if you're protected by civil rights laws or if you've never seen a written policy that prohibits drinking during work hours, your employer can hold you to certain performance standards that you might be unable to meet if you return to work in an alcohol-impaired state. Can You Be Fired for Drinking Off the Job?